From the promise Joseph remembered as he stood betrayed and alone ... to God's extraordinary promise of all in John 3:16, the Word of God is an iron-clad guide for daily living. Pairing 101 of the most powerful Bible promises with a devotional reading and prayer, Ford offers an inspirational guide on how to apply God's will and his love to your life. With insight, she points out God's commitment, applies it to real life, and provides encouragement to help you live according to His word. "Simple Abundance" meets "The Complete Book of Bible Promises" in this powerful and inspiring collection of God's promises, as referenced in the Bible. This latest offering in The 101 Most Powerful series sets out to motivate, encourage and redirect Christian believers through 101 powerful biblical promises. Utilizing a combination of historical facts, current newsworthy happenings and anecdotes from her own life, Ford succeeds in fleshing out key biblical principles, providing her readers with substantial truths to reflect upon long after the book has been closed. Whether Christian followers suffer from a joyless existence, need wise instruction or find themselves mired in religious legality, Ford supplies biblical cures found in the Old and New Testaments. Her pithy, energetic style makes the reading and the contemplating palatable, while she simultaneously offers a faithful, biblical perspective. Each promise opens with a Scripture verse; a concise but ample essay commenting on said verse, including lessons applicable for daily life; and a direct prayer. Ford snares her readers' attention with fascinating historical tidbits woven through many of her devotions. Take the reference found in Luke 6:38, where believers are instructed to give generously, expecting that their gift will be returned to them in the same measure. Ford provides a mini-sidebar detailing the habits and customs of grain merchants from Jesus' time, explaining how each merchant was, if honest, always to err on the side of the customer. Readers from across the Christian spectrum will discover help, hope and instruction within this compilation of powerful promises. (Oct.) Copyright 2003 Reed Business Information. 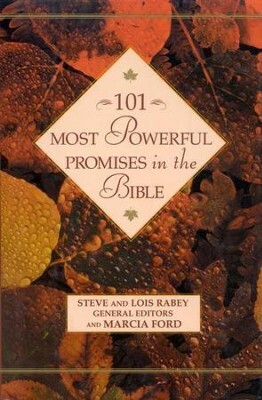 I'm the author/artist and I want to review 101 Most Powerful Promises in the Bible.